I don't have a boy... but I can only imagine how incredibly hard it is to find that just perfect outfit for him when you have a formal engagement to attend. So, I came up with the Tuxedo Onesie. It's a hit for any occassion, but how adorable do these two boys look in their tuxedo onesies. How cute would they be just for any occassion? Especially pictures! So cute they don't even require pants. Make a statement bringing your lil' man home from the hospital for the first time! I hand make the tuxedo bows as well, so they can easily be customized to match any gorgeous wedding colors you have in mind! Wanna check out this onesie directly? Go here. 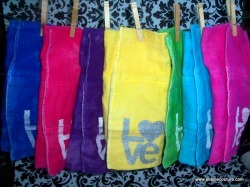 Who wants regular ole' burp cloths? Isn't your prince or princess way too good for those? They are a steal either individually or a steal if you buy a set of three. 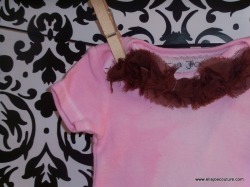 Perfect for the posh baby in your life! What about a boy? Check out our burp cloths that also feature a guitar screenprinted. Afraid that the ink on a screenprint might be a little rough? Then try our bleached effect. Want the babies name? We have a variety of fonts to choose from and any special spelling can easily be made! Perfect for the prince or princess that you have a hard time finding personalized items for. And it doesn't stop with burp cloths either! The same goes for our onesies! This is another piece that incredibly unique to Ella Joe Couture. This onesie is actually named for Robin from How I Met Your Mother. It was inspired by a shirt that she wore in the show. It was seen one night and I absolutely had to make a onesie that would resemble it! 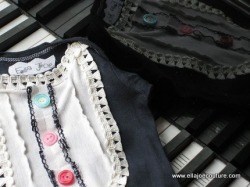 Vintage lace and trim were chosen to adorn the black hand dyed onesie, an upcycled t-shirt for the overlay and mismatched buttons to top it all off. This onesie was a collaborations between the bride, the mother of the flower girl and I. I think that it turned out beautifully. Two rows of raveled rosettes that were airbrushed lightly with a silver glitter adorned the center of a onesie across the chest. It's a perfect onesie to put with a tutu for any occasion, but should never be overlooked when needing wedding attire for your little Princess. This onesie was also featured in this blog. Ella Joe Couture actually started with this very onesie! Actually, it was a slightly different variation. It was Pouty Pink! rosettes that graced the chest of a plain white onesie. Oh my how things have changed! Now, the rosettes are available in an array of different colors and put on an array of different colored onesies! All of which are hand dyed by the way! Now they are available either around the neck or across the chest. It's your call, and the best part is, no matter how simple you want the onesie or where you want the rosettes, since they are all made to order, there isn't an extra charge for any color or where you want to put them! Talk about chic!